cost means of talking to modern cars. Interface can also be used with other software supporting the ELM327 chipsets, e.g. EngineCheck. Easy-to-use multi-protocol interface to connect your PC to the 16-pin socket on the car. Why take your car to the dealer for a code-read? You can now read and clear your engine fault codes on your own driveway! For full details and our coverage list, please visit the VauxCheck website. Please note: Software not shipped on CD - software download information sent by email. Which cars can I connect to? Most Vauxhall and Opel cars from 1997 to 2008. Please see our coverage lists for supported engines. Please email us if you would like to confirm compatibility with your car. 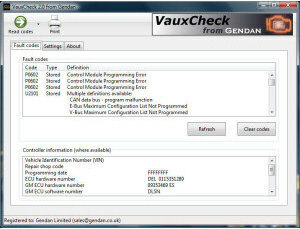 Please note the price of this item includes a licence for the VauxCheck software, which requires activation before use. If the product is returned to us as an unwanted item, or because it was purchased for an incompatible vehicle, we cannot provide a refund of the cost of the software (£30.59) once an activation code has been issued. The remainder of the cost of the item may be refunded, in line with our standard returns policy. dispatched and delivered in less than 24 hours!! ordered on Friday afternoon delivered Saturday morning!! well packaged, easy installation and user instructions. Great on line support for use and installation. Really straight forward to use. Would recommend this to anyone. 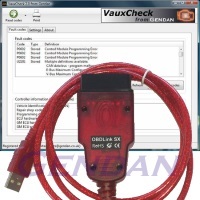 Purchased the Multi-Protocol USB interface and VauxCheck software. The interface is a very well made product with quality cables and connectors. The software installation on my old IBM Thinkpad laptop (XP) was no problem. Indeed, the activation code arrived instantly after entering the details via the desktop PC. Better yet, connecting the system to my Corsa B diagnostic port revealed all, problem fixed with a bit of spanner work and clearing the codes of doom. Many thanks. the product solved my problem straight away by resetting car spanner light on my combo van due to a failed DPF regeneration process a 20 min drive to complete the regeneration process to ensure the light did not return limp home mode had been reset. the sales and after care are excellent, this company is first class as a result i will be contacting gendan again soon to purchase the engine check pro.